The timetable on this service will be revised to improve reliability. 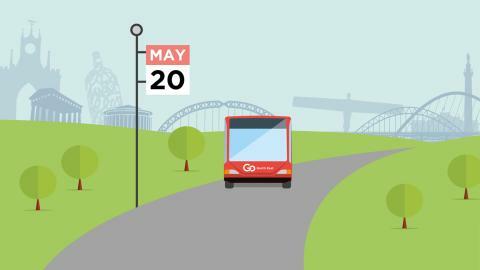 Saturday morning journeys that run from Lobley Hill to Gateshead only will be retimed to improve co-ordination with other buses on Bensham Bank. There are no other changes to the times of this service. There will be minor changes to the times of buses that run between Concord and Washington Galleries only. There will be some changes to the times of journeys before 9am. Journeys will be slightly retimed to improve reliability. Following customer requests, morning journeys on this service will now terminate at Team Valley Marquisway (for Retail World) instead of Kingsway South. On a Saturday only, the journey at 5.34pm from Newcastle will no longer run, with the journey at 5.44pm from Newcastle departing at 5.39pm instead, and running five minutes earlier throughout. There are no other changes to the timetable of this service. Some early evening journeys are retimed to improve reliability. Following customer requests, the weekday journey at 6.13am from Consett is slightly retimed to improve reliability. Following customer requests, an extra journey will be added on service X71 on weekdays, departing Hat and Feather Pleasant View at 8.55am and arriving in Consett at 9.04am.